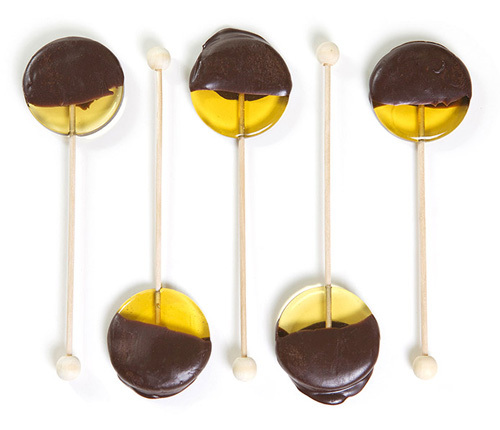 When I saw these honey lollipops dipped in dark chocolate, all I wanted to do was order a case of them. These tasty treats are the brainchild of Kara Brook who started beekeeping as a way to make beeswax for her encaustic paintings. (encaustic paint is made with beeswax, damar resin and pigment) Soon, however, she stumbled upon something quite unexpected. Kara, "In the process, I made the serendipitous discovery that honey is a much more precious gift from bees than wax." 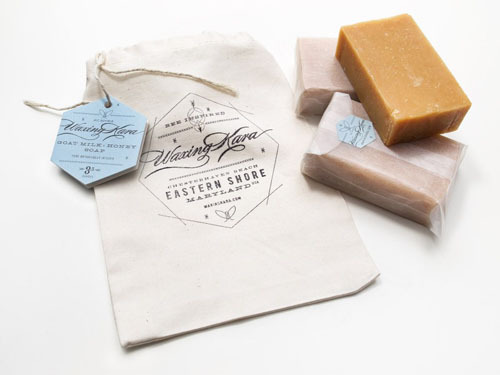 Kara now creates a bevy of natural products from her bees at Chesterhaven Beach Farm along Maryland's Eastern Shore. A true artist at heart, she finds deep satisfaction in keeping her bees happy and healthy. As we all know, without bees, we as a civilization cannot sustain our own agriculture. Kara, "It is my hope that you feel the expansive energy of life in the bees, sun and the waves instilling within Waxing Kara products." Above, are her wildly popular Honey and Lavender Pops. Her honey looks and sounds divine. This year's Spring honey has notes of apple, pear, black locust, lavender, tulip poplar, wild blueberry and blackberry, clover, tupelo and wildflowers. The black locust tree is native to eastern North America and this past year it was in full bloom, filling the air with a sweet scent. This made for a bold and fragrant honey that goes beautifully with greek yogurt or bold cheeses. Kara loves the Orange Blossom honey mixed with butter on hot cornbread. It also pairs well as a syrup for pancakes or combined with a dark chocolate dessert. The Field of Wildflower honey is an excellent daily honey with a mild floral flavor and a strong, earthy finish. As honey is so good for the skin, Kara has also created a Honey Body Scrub and Body Butter. The Scrub is used for exfoliation to reduce signs of aging and brighten the skin texture while the Butter provides lavender scented moisture for up to 24 hours. So much goodness...learn more about her line of face and body products, here. Kara appears as busy as her bees as she also offers six different honey soap options- some with lavender or citrus blends, others with oatmeal or clove and cinnamon.